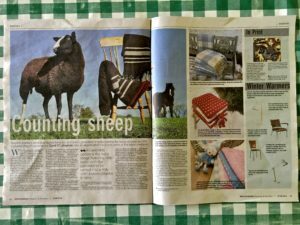 I was notified today by a friend via Twitter that my Zwartbles blankets were in Saturday’s Irish Examiner ‘Property’ section (27 August 2016). There is a huge photograph I took of my blankets. It is a wonderful report about Irish woollen blankets and how they are coming back into fashion!! 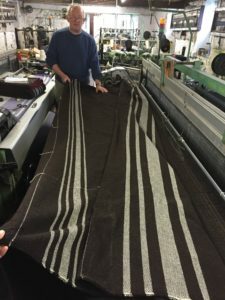 Most of the article describes many different Irish woollen blankets, their history and the mills that made them. Sadly many of these mills no longer exist. This report portrays the few remaining Irish mills that we must treasure and keep alive. These old skills and crafts that transform fresh shorn raw sheep fleeces into wonderful yarn which can be dyed and woven into Irish tweeds, blankets and scarves must not be lost to contemporary society. 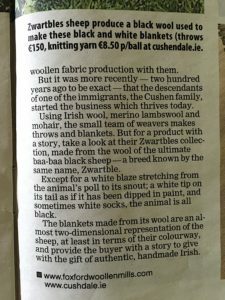 Below the journalist wrote an excellent description of my Zwartbles blankets woven by Cushendale. 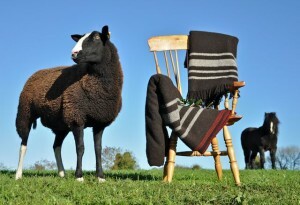 I work very hard using social media to advertise my blankets by telling the story about farming and the life and times of the Zwartbles sheep. These blankets are my concept. I designed them and Cushendale Woollen Mills cleans, spins and weaves the Zwartbles wool. Master craftsman Philip Cushen helps me adjust my design to make a perfect woollen blanket that represents Zwartbles sheep and their unique rich colouring. 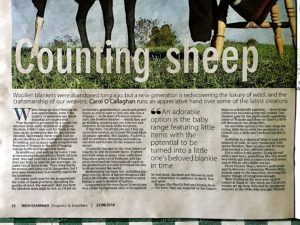 I remember I received an email from the Irish Examiner that requested a photograph of my Zwartbles blankets for an article “a feature about Irish textiles and including a piece on Cushendale”. Was I was wrong to assume I would be credited for my photograph (which is normal practice for photographs in newspapers) and that I should be mentioned by name in the article? This excellent article’s flaw is careless copy editing. In good journalism credit is always given where credit is due. 3 Responses to How does Hard Copy Journalism Get it so Right But So Wrong?